For long lasting, healthy hair extensions, Keratin bonds are the crème de la crème. Using 100% silky smooth human hair, the I&K Pre Bonded Nail Tip Extensions are not only stunning, but kind to your hair - and it’s all down to the Keratin. Knowing that your natural hair is taken care of with the safest natural bonding agent around, you can focus fully on getting the ‘do of your dreams. Choose your length, choose your volume - and bond away. And, if you ever want to remove them, the Keratin makes it easy and effortless. Each strand is sleek, straight, and stunningly impressive - like your natural hair, but so much better. In a range of shades from bombshell blonde and brilliant brunette, to radiant red and beautiful black, you’re guaranteed a seamless blend. And if you fancy going for a colour pop, I&K have that covered too. Glossy, soft, and sassy as sin, the Nail Tip Extensions add length and volume in an instant. Using the highest quality, easy to apply human hair, you’ll stay selfie ready from morning ’til night. Amazing product. My first experience buying from here. I ordered the darkest brown 18” pre bonded extensions and WOW. The colour match is unreal. And great delivery time. Only fault would be that when I took it out I the packaging it was folded in half resulting in a severe crease in the middle but just had to straighten it out. Other than that I’m thrilled and have already purchased another product. Thank you. Had lots of hair extensions but these are amazing - super soft and blend in perfectly with my hair. I\'ve ordered from this site numerous times. It was the first place I bought hair from and because the quality is so exceptional I haven\'t bothered trying anywhere else. Also the service is excellent, this last order I selected free next day delivery and the parcel was here at 9 am the following day. I\'ve never had to ring customer services for anything. I would highly recommend this site to anybody. I order all my hair from here, after trying many different brands and websites this is by far the best. Little tip for anyone wanting platinum blonde extensions, order 613 and bleach them for half an hour with 9%. They are a perfect white blonde! Great Hair they look and feel amazing and blend really well used hair trade for years all my clients have loved the hair once they are in. As long as you look after them they last great. After spending hundreds on a Premium brand of Hair Extensions I could no longer afford this and wanted some hair more suited to my budget. I've been wearing these extensions for several weeks now and am really pleased. I find a good serum applied daily helps with any tangles! I will order again and may try the Remy version next time! What good value for money these are and speedy delivery. as a training video not very good at all, clips too big and rolling surely should be away from the scalp never saw any polishing of the bonds either.? absolotley lush hair my friend payed over 300 for cinderalla hair and mines half the price and looks much more natural and real and dead easy ro maintain i completly recommend!!! Iv used this hair regulary for the past year. Its very good quality for the money. Iv only had 2 bad batches which have knotted badly.Which they were happy to refund once the hair was sent back. But i order hair every month and had no problems otherwise. Nobody can tell i have extentions the macth to my hair colour is great. I would definitly recomend this product. Ordered my daughter's hair for an early christmas present and the service was delightful. They gave me next day delivery and should get them Tuesday. But delightful easy to use site. Thanks! i aways buy my hair extentions off this site they are brilliant quality and have always lasted me months! great value for money! Just had this hair put in and its brilliant! Ive had non remi hair in before and it has notted terribly...this hasn't and looks great! Love i! Absolutely gorgeous and the colour is just right I think its very good value for money.I've just sent one to my friend. Quick delivery and it looks fantastic and good combination with mine. Arrived the day after ordering! Stunning hair, extremely silky and well bonded. Photo does not do the colour justice, amazed at the quality for such a low price! 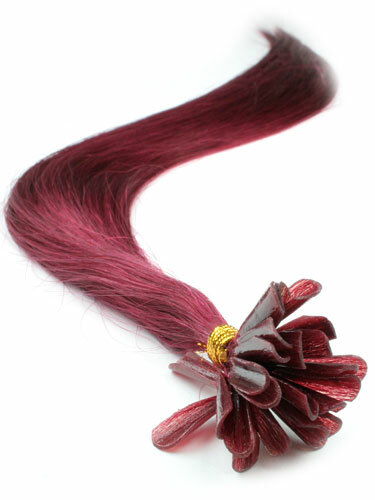 Great quality hair, lovely colour and mixes well with the burgandy hair colour. REALLY impressed with the quality of this product, the website made it very easy to order, the delivery service was excellent, and the hair itself is fantastic. will definitely use again! I am please the the quality has been very persistent and our clients love em. Also a very nice product!!! Very smooth and silky hair. Very happy and pleased. Really good product!!!! I recomend it to everyone. Really good price also. I ordered it to Finland with no trouble with paypal. I am very pleased. Thank you Hairtrade. I have brought from several over websites in the uk and this is by far the best quality hair for the money it costs and quick delivery, my second order with hair trade. I bought this pre-bonded hair three weeks ago, and I have nothing bad to say about it. The keratin is top quality. The hair is easy to style and do not tangle up. it looks great! i have never had hair extension before, i am sure this will look real and functional on me. i dont understand why this page dosent want me to by these hairs??!??!??! EXCELLENT VALUE FOR MONEY. VERY PLEASED. THANKYOU. Looking forward to try this hair. tilaan hiukset itselleni teht?v? ?n pidennykseen, enk? v?lit? hiuksia eteenp?in. tilaan hiukset itselleni teht?v? ?n pidennykseen enk? v?lit? niit? eteen p?in..
tilaan hiukset omaan k?ytt??n.enk? v?lit? niit? eteenp?in.